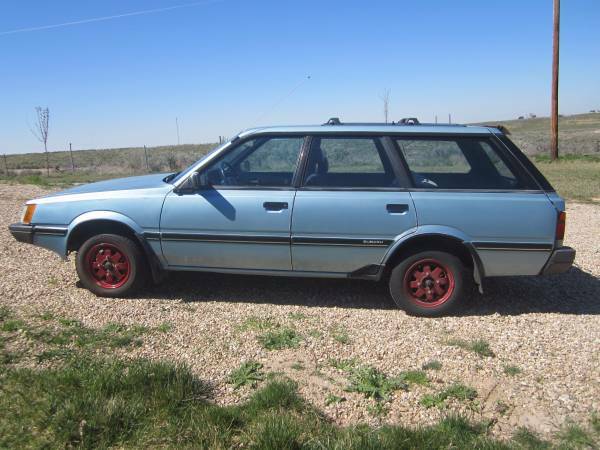 What is a good condition Subaru GL worth on the open market? It sounds like an opening to bad a joke, but this is a serious question. Just because the GL isn't a high dollar classic doesn't mean it isn't worth something to somebody, and there are certainly more overly restored 911s than nice condition GLs in the world. 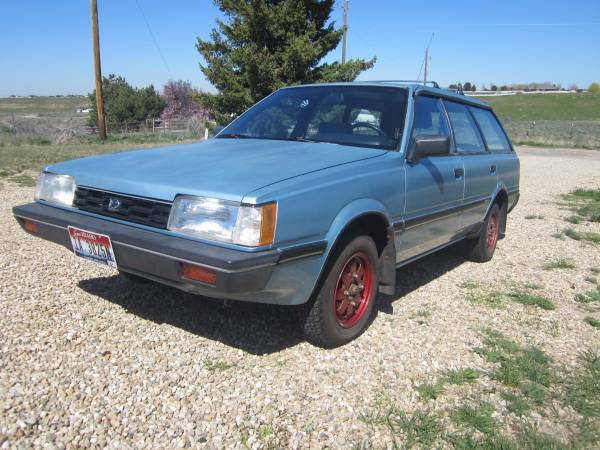 Find this 1985 Subaru GL-10 Turbo offered for $1700 near Boise, ID via craigslist. Tip from FuelTruck. The GL was known as the Leone (Italian for lion) back at the factory in Japan where it was built from 1979 through 1989 as a sedan, coupe, hatchback, wagon, or El Camino (the BRAT). Today's wagon variant is probably the most useful of the bunch as it combines people carrying and junk carrying with equal aplomb. Under the hood is a 1.8 liter EA81 flat-4 that squeezes out 111 horsepower and 134 ft-lbs of torque with the aid of fuel injection and a non-intercooled turbocharger. 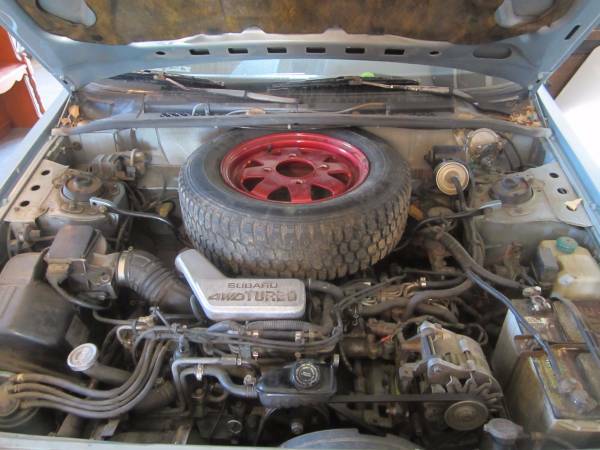 The 4-door Turbo wagon was only available with the 3-speed auto from the dealer, but someone stuck in a manual gearbox and kept the original part time 4-wheel-drive system functional. 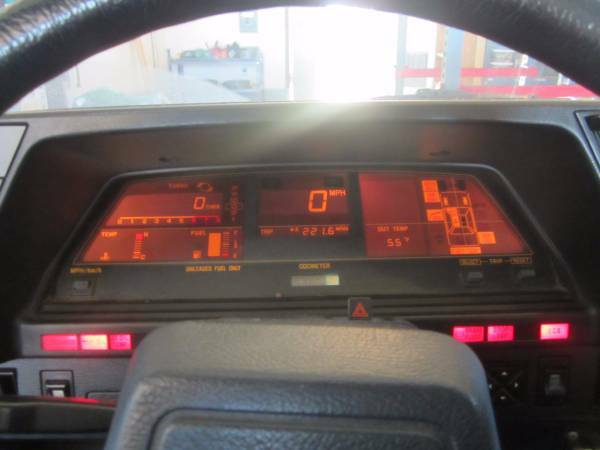 From behind the steering wheel you get an excellent view of the futuristic amber digital dash -- a marvelous thing of the future from the past. I had a string of these back in the daze when I lived on a dirt road. They "only "achieved about 20 mpg average which was still better that a full-frame 4X4. This one with remote air cleaner was able to fit a full-size spare-the carb. models had an air cleaner housing in the way so only a mini-spare would fit. In Vermont, this era Scoobie-Doo's turned to potting soil very quickly. Too bad because they were tough, simple and great in snow and mud but being water soluble did them in. I remember when mine finally gave it up on Hwy 6 about 5 miles south of College Station. It was Friday night, and the Aggies were playing the next day at Kyle field so the town was chock full of revelry, lubricated as Texans are wont. Anyway, my GL started belching supra-atmospheric coolant at an alarming rate and I had to leave her amongst the blue bonnets as I began the slow trot back into town. Anyway, I get on the outskirts of Aggieland and a Silverado full of tea-sips buzzes me and throws an empty can 'o pop in my direction, to which I respond politely, using simple language as I reckon they were mentally challenged. Brake lights, reverse lights, rapidly enlarging tailgate follows, to which I am too pissed off to smartly flee from, given my just-previous hour of trotting up an unlit Hwy 6 at about 10pm. Anywho, I took two of 'em and only got a black eye for my trouble. 'Course, I was fighting sober and they were definitely not. I had one of these Subies in college too. Looked just like the one posted here, same generic light blue, but sadly sans turbo & AWD. Yes, sub-century hp and FWD, and the handbrake engaged the front wheels for some inscrutably Japanese reason. But it had enough weight in the rear to get the pendulum action going on dirt roads and pretend I was Petter Solberg for a few turns, until I would lose control and plow into a pile of Chromium-6 infused soil, or some such.